A polar bear mother gives birth while hibernating, then goes back to sleep for another two months. A male seahorse carries a female's eggs in a pouch until they are ready to hatch. 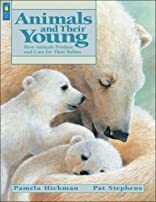 Whether by giving birth, protecting their young or teaching them survival skills, animals produce and care for their babies in some extraordinary ways. Containing lots of interesting facts, activities and easy-to-do experiments, this title in the Animal Behavior series takes a resourceful approach to exploring animal life.